With so much attention constantly focused on the Royal family, it’s hard to imagine a time when England will be missing it’s Queen Elizabeth. Fans are always keeping an eye out on Her Majesty, especially when it’s about anything that concerns her wellbeing. 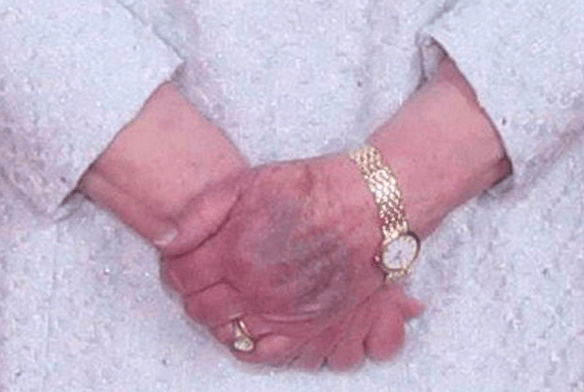 Although she mostly seems to be in good health, some photos surfaced from yesterday, that showed an alarmingly purple, swollen, and bruised hand on the Queen. 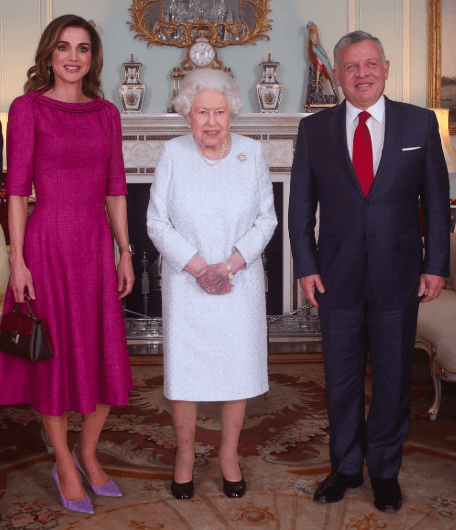 Nothing about the Royals’ ever goes unnoticed, so fans became concerned when they recently saw Queen Elizabeth’s hands in the new photos leaked from the King and Queen of Jordan’s visit to Buckingham Palace yesterday on March 1. In the pictures, the Queen looks happy and healthy, wearing a gorgeous light blue dress with pearls, sporting a gleaming smile. However, her hand appears to be bruised. 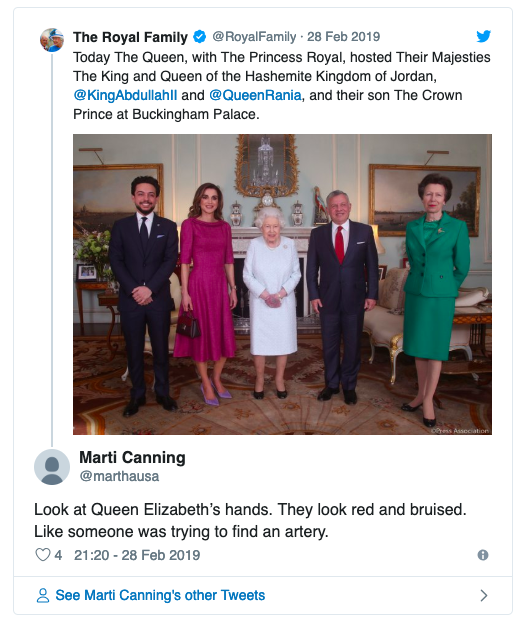 Royalists are worried that her swollen, purple hand might be a sign that there are some issues with the 92-year-old’s wellbeing. It hasn’t been an easy last couple of weeks for the Royal Palace. 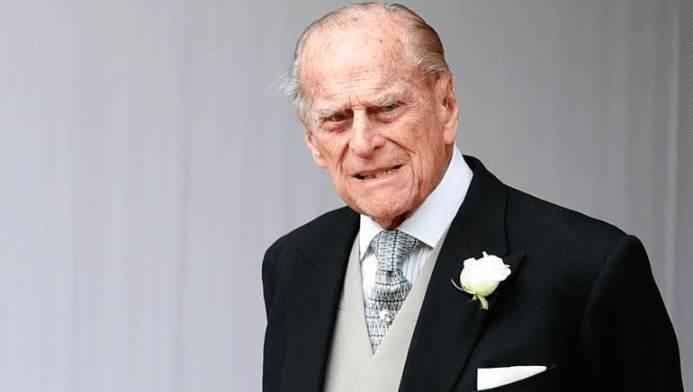 This news comes shortly after the Queen’s husband, Prince Philip, was involved in a serious car crash by Sandringham Estate in January. The 97-year-old royal came out unscathed from the unfortunate accident, but two other victims had to be hospitalized and treated for injuries. 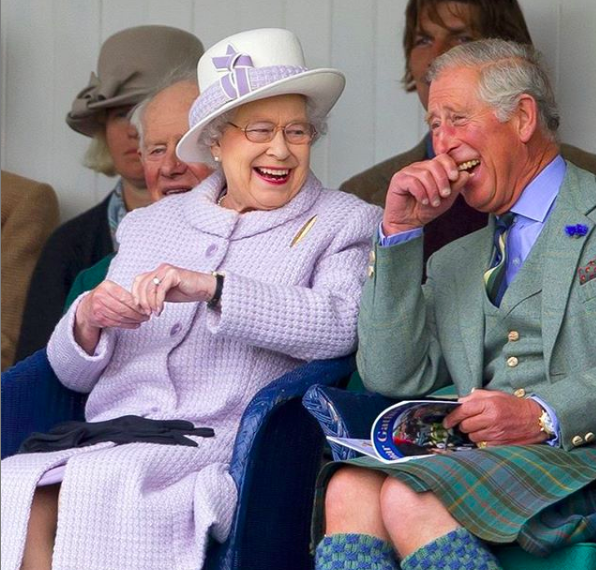 Now, it looks like the Queen is dealing with what could possibly be some new injuries of her own. IS IT A MEDICAL CONDITION? 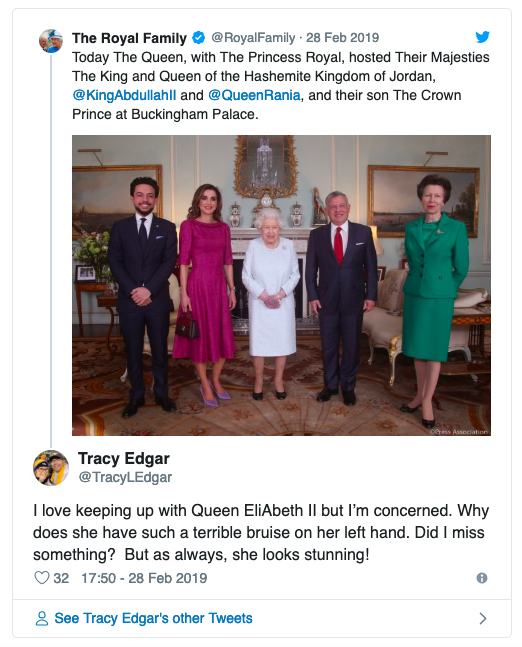 Although the palace hasn’t commented on the condition, there can be a number of different medical reasons for the bruising, which shouldn’t cause major alarm. For example, something as simple as blood thinning medication or steroids can cause easy bruising on the skin. 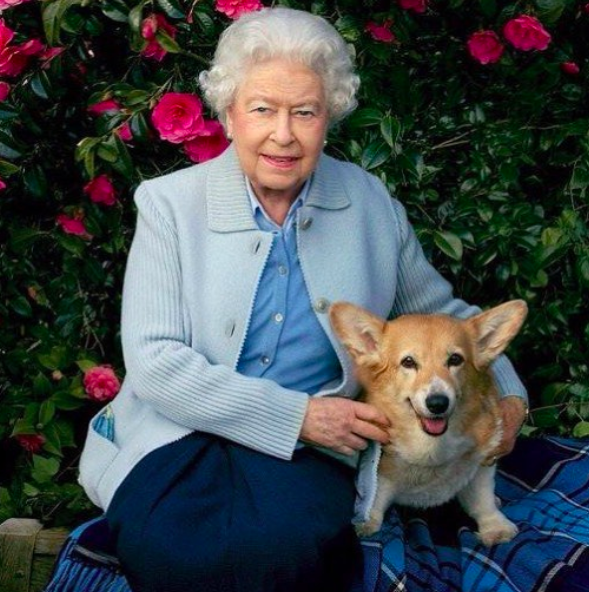 Secondly, we need to take the Queen’s age into account as well; as you begin to age, and especially when you’re 92, you become much more (fragile). Skin begins to thin, and the tissue underneath becomes more fragile as well. 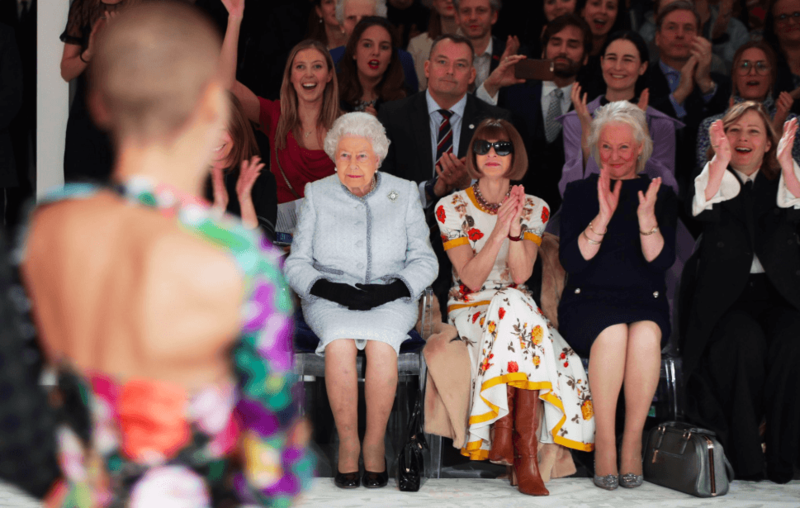 Because she’s been England’s monarch for more than six decades, the public is always keeping an eye on Queen Elizabeth’s wellbeing. 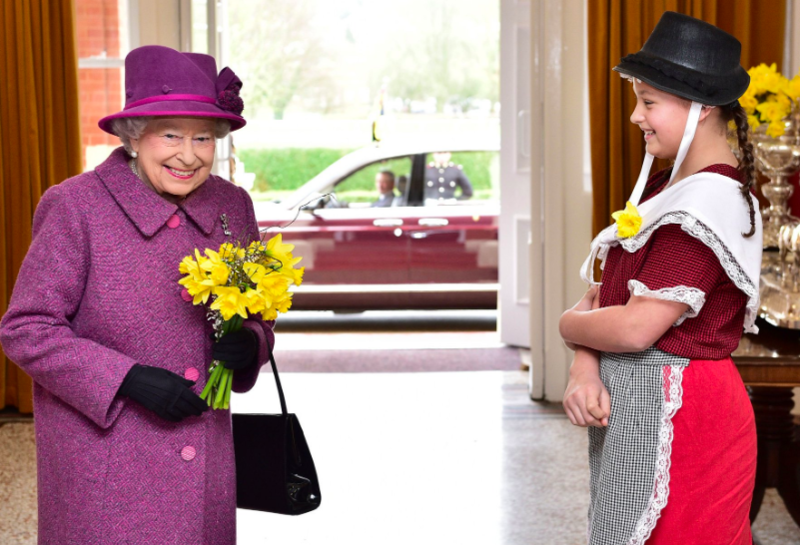 In recent years, health concerns have hit an all-time high, since the Queen has been missing a number of royal events and outings, as well as important photos. This past November, Her Majesty was absent from a family portrait that was taken just before Prince Charles’ 70th birthday. 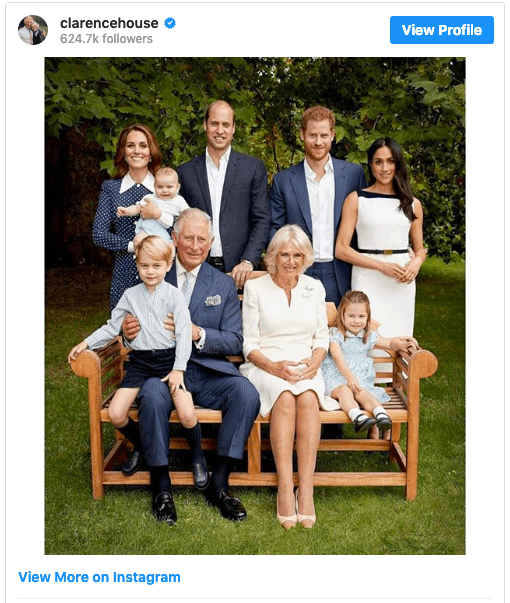 In the various portraits, the Prince of Wales, Prince William, Kate Middleton, Prince George, Princess Charlotte, Prince Louis, Prince Harry, Meghan Markle, and Camilla Parker Bowles were pictured, smiling wide. However, the Queen was absent and many started to wonder whether this had to do with deteriorating health conditions. The palace never ended up directly addressing the concern; some believe the Queen’s absence was either due to an illness, or a message that she was trying to send. This could have been a move that was done on purpose, in order to remind everyone about who our future monarchs are. But, fans should find comfort in the fact that Queen Elizabeth tries to stay as healthy as possible. Although several members of her family smoked, the Queen strictly refrains from the bad habit: “Both her father and her sister smoked, but it never attracted her. It was something that just didn’t appeal,” Dickie Arbiter, who was her former press secretary, told the BBC. In addition, multiple deaths in her family were directly related to a smoking illness, which is something that could’ve also influenced her decision to stay away. How did the relations between Queen and Princes William and Harry change after they lost their mother? Queen rejects Harry's and Meghan's request of having an independent office. Although the future sounds like a long and promising one for Her Majesty, apparently the Queen’s cause of death has already been laid out for her by the Buckingham Palace officials. The Guardian stated that the Queen will most likely pass away from a short illness - even though her health is in seemingly perfect condition. The palace believes she will die in her bed, surrounded by her loved ones, but that the passing will be an illness-related one. It might not be the most pleasant conversation to have, but it sounds like the Queen has had to prepare for the inevitable. Regardless of the concerning photos of the Queen’s hand, we’re happy to see Her Majesty happy, healthy and smiling in the leaked images. What do you think? 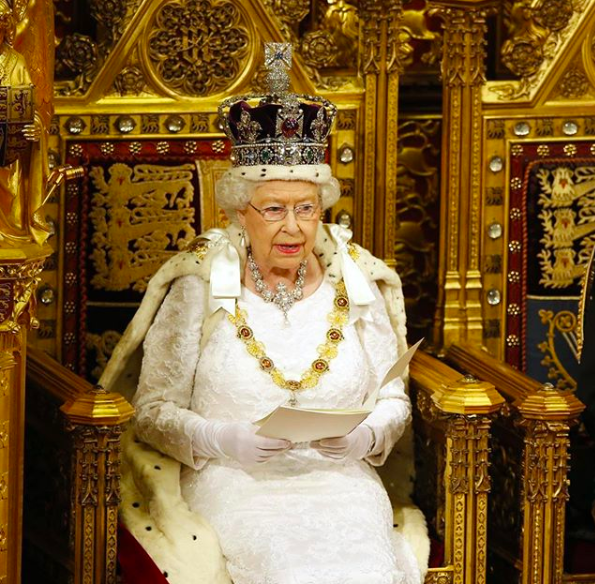 Is there a reason to be worried about the Queen’s wellbeing? Or could it just be a simple injury or side effect? Let us know what you think in the comments below!